MISSION, KS--(Marketwired - Oct 3, 2016) - (Family Features) For millions of football fans, the grill is as important as the gridiron when enjoying a weekend of games. There's nothing like team spirit, the anticipation of kickoff and the smell of a delicious pregame tailgate wafting through the stadium parking lot. National barbecue expert Rocky Stubblefield of Stubb's Legendary Bar-B-Q offers tips and recipes for game day grilling that will have the whole crowd cheering. 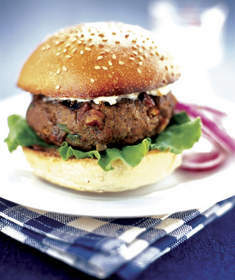 Stubblefield says anything that cooks fast on the grill is great for tailgating -- burgers, hotdogs, chicken -- and to bring on the flavor without having to pack a carload of ingredients, use sauces, rubs and marinades. Prepare as much food as you can ahead of time and have a checklist for the things you always need but are easy to forget, like napkins and tin foil. For perfectly shaped, evenly cooked burgers, make a thumbprint in the middle of each patty before grilling. Amp up the flavor by rubbing your burgers with Stubb's Bar-B-Q rub before putting them on the grill -- just like you would a brisket or ribs. No matter what you're making, wait to put the sauce on until the very end of grilling to avoid charring and burning. Grill burgers over direct, medium heat, first on one side then the other, 7-10 minutes, until they reach desired doneness. Medium burgers register an internal temperature of 160 F.